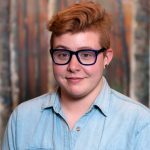 Greenlee is a writer, a musician, and a community organizer. Before moving to Chicago from Buffalo, NY, they received their MA in English and taught writing classes and led gender and sexuality workshops at both the high school and college level. They were also very active in local queer and poly communities helping to develop and lead many events. Greenlee is currently supporting the intake and administrative processes at LifeWorks as well as promoting KPACT events in Chicago.